Showing results for tags 'uzi'. Single owner Vector Arms UZI registered receiver 9mm/22LR/45ACP. 9mm original includes a .22LR conversion kit, a recoil buffer, all magazines shown, and an optional Gemtech Mossad-II suppressor (included n/c). Rifle was lightly fired over the years, primarily with the .22LR kit installed. $12,000, located in Oregon on a Form 4. Vector Mini-Uzi For Sale - Form 4 - $17,000 OBO 9mm, Registered Receiver, One owner, great condition, comes with side-cocker and 10 mags. NIB Vector .45 Grease Gun conversion , BarrelXchange .45 Bolt 2 .45 barrels and 3 Grease Gun mags. I accept checks and money orders. Full payment starts the paperwork and I will cover the first transfer. Shipping and all other transfers are the responsibility of the buyer. WTS: Pre May samples, SBR, and SBS. 4 Guns for Sale ELITE IRON Suppressor and Bipod Solutions of a Higher Caliber Please email questions to info@eliteiron.com Thanks for looking, Kathy FFL/SOT in MT 406-244-0234 Guns are also listed on our website and have additional pictures. https://www.eliteiron.com/product-category/nfa-items/ Pre May IMI UZI $7000 9MM Overall Very good + condition. Aftermarket threaded barrel. Original box with sling, manual, cleaning rod, and 1 magazine. Class 3 sales sample. No LE letter required. FN G1 Pre May $7000 FN G-1, 7.62mm NATO, PRE-MAY Sales Sample. In VG+ condition. Bore and Chamber in excellent condition. Wood stock has slight marring. Manufactured by: FN Liege Belgium IMP: Inter American IMP/EXP Co Class 3 sales sample. No LE letter required. IAC Model 1887 SBS $300 IAC Model 1887 Short Barrel Shotgun 15.5" Barrel 32.5" Overall Length. Condition: Like New with Original Box. Work done by ELITE IRON This NFA item will need to be shipped to Class 3 dealer in your state. Vector Arms PTR-91 SBR $1400 J.L.D. Ent. Model PTR-91 converted by Vector Arms. .308 Cal. “Sear” Ready. Barrel length 9″, overall length 31.5″. Condition: Excellent, 1 light scratch mark on trigger housing. 1 magazine included. 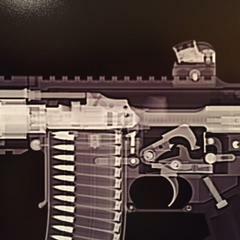 This NFA item will need to be shipped to Class 3 dealer in your state.